We are an authorized agent for the Autonomus University of Barcelona (UAB) that lendsits many years of experience in the language sector to students fromacross the world. The best guarantees. 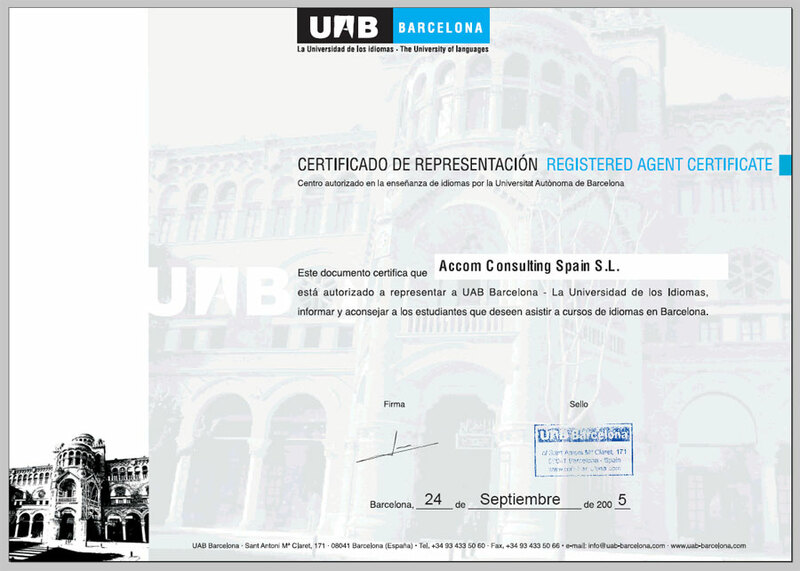 Barcelona-University.es is an official agent for the University (clickon the image below to view our accreditative documentation). Experience. Wehave years of experience offering Spanish Courses to thousands ofstudents of all ages and backgrounds. Our goal is to help studentschoose the course that best suits them. Barcelona-University.es is a websiteowned by the Spanish company Accom Consulting Spain S.L., which is listed in the official Business Register of Barcelona (Registro Mercantil) with the following Cif and registration number numbers (Cif B92515113, Tomo 3501, Libro 2413, Folio 197). 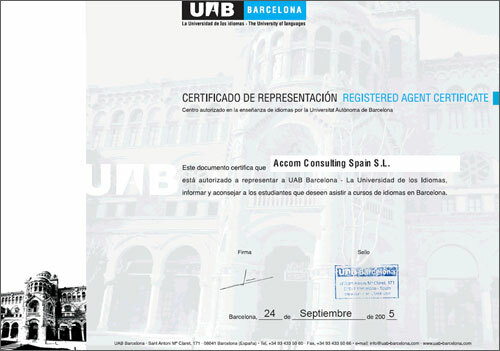 Accom Consulting Spain S.L., as an authorised agent for the University of Barcelona (UAB) (click here to see our accreditative documentation), has created www.Barcelona-University.es to exclusively promote the Spanish language courses offered by the Autonomous University of Barcelona (UAB) ;lending their many years of experience in the language sector to servestudents from all over the world who wish to study Spanish at thisUniversity in Barcelona. Our aimis to provide accurate information on the courses available at theUniversity, to help students choose the course that best suites them aswell as assist them in finding suitable accommodation for the durationof their stay. To know more about the Autonomous University of Barcelona, please see UAB Information. To check UAB Facilities and activities, chek out UAB Facilities.